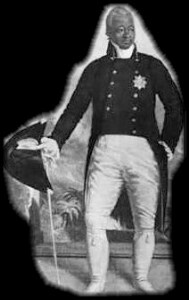 Henri Christophe was born in 1757 on Grenada. In 1778, he fought as a volunteer in Savannah, Georgia, for the independence of the United States of America. He was only 21 years old. Henri Christophe was a lieutenant of Haitian black revolutionist Toussaint L'ouverture, who fought the army of Napoleon during the War of Independence. Christophe is very well known for his influence in the northern section of Haiti, where he built monuments, palaces and forts. He proclaimed himself King of Haiti in 1811 and created an atmosphere of discipline, work, and education in that region. He was feared and regarded as a man of steel. He carried an extraordinary vision of grandeur for the Haitian people, which can be seen in his accomplishments. Among his magnificent works are the Citadel that carries his name, and the Sans-Souci palace, which, even in ruins, draws admiration. Paralyzed by a stroke and faced with the weakening of his army, Henri Christophe took his life on October 8, 1820. He remains the most admired of Haitians for his genius and advanced vision of Haiti as a civilized and prosperous nation. he coauthored with Charles V. Hamilton, Black Power, the Politics of Liberation in America. He became the Prime Minister of the Black Panthers, and later moved to Guinea, West Africa after becoming disenchanted with the Panthers. While residing in Africa, Stokely Carmichael changed his name to "Kwame Ture" to honor Kwame Nkrumah, who led Ghana to independence from Britain, and, Sekou Toure, who was President of Guinea and his mentor. For more than 30 years, Ture led the All-African People's Revolutionary Party and devoted the rest of his life to Pan Africanism, a movement to uproot the inequities of racism for people of African descent and to develop an economic and cultural coalition among the African Diaspora. To the end he answered the telephone, "ready for the revolution." His marriage to Miriam Makeba and Guinean physician Marlyatou Barry ended in divorce. 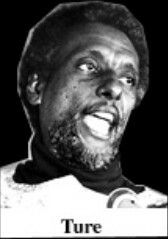 In 1998, at the age of 57, Kwame Ture died from complications of prostate cancer.